On All Hallow’s Eve this year, at London’s Barbican Hall, the London Contemporary Orchestra, under the baton of their co-artistic director Robert Ames, managed with two symphonic pieces to drown the world and set it ablaze in the space of a single evening. Giacinto Scelsi’s portentously titled Uaxuctum: The legend of the Maya City, destroyed by the Maya people themselves for religious reasons, evoked the mysterious and violent collapse of that once thriving civilisation; the second piece of the evening, composer and climate activist John Luther Adams’s Become Ocean, looked to the future, the rise of the world’s oceans, and good riddance to the lot of us. 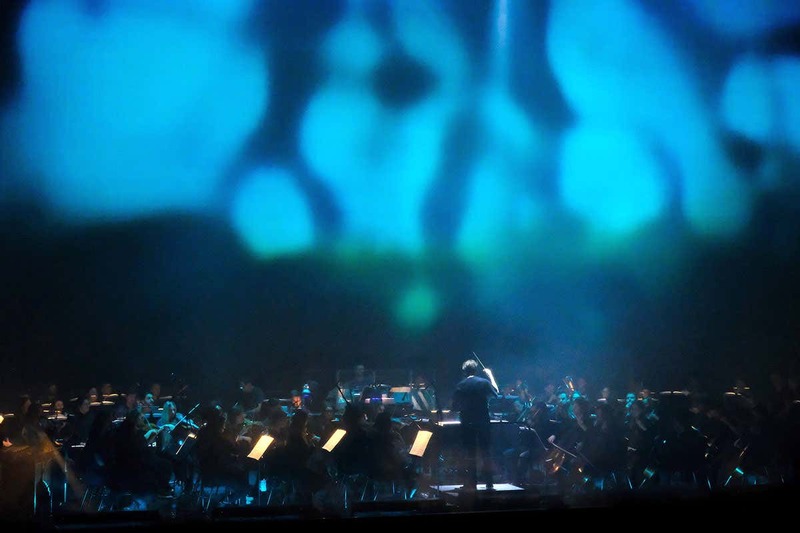 Lost Worlds was a typical piece of LCO programming: not content with presenting two very beautiful but undeniably challenging long-ish works, the orchestra had elected to play behind a translucent screen onto which were projected the digital meanderings of an artistically trained neural net. Twists of entoptic colour twisted and cavorted around the half-seen musicians while a well-place spotlight, directly over Ames’s head, sent the conductor’s gestures sprawling across the screen, as though ink were being dashed over all those pretty digitally generated splotches of colour. 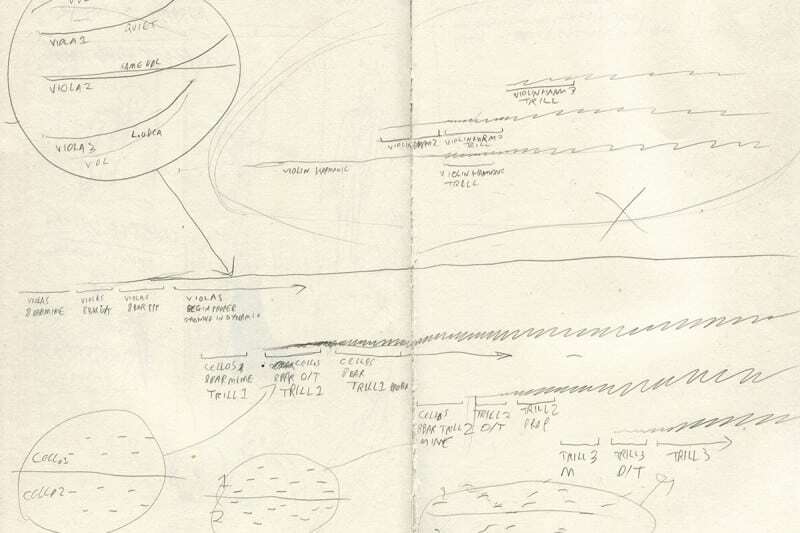 Everything, on paper, pointed to an evening that was trying far too hard to be avant garde. In the execution, however, the occasion was a triumph. Now, as 2018 draws to a close, artificial intelligence is being hurled at the problem. For this occasion the London-based theatrical production company Universal Assembly Unit had got hold of a recursive neural net engineered by Artrendex, a company that uses artificial intelligence to research and predict the art market. According to the concert’s programme note, it took several months to train Artrendex’s algorithm on videos of floods and fires, teaching it the aesthetics of these phenomena so that, come the evening of the performance, it would construct organic imagery in response to the music. While never obscuring the orchestra, the light show was dramatic and powerful, sometimes evoking (for those who enjoy their Andrei Tarkovsky) the blurriness of the clouds swamping the ocean planet Solaris in the movie of that name; then at other moments weaving and flickering, not so much like flames, but more like the speeded-up footage from some microbial experiment. Maybe I’ve worked at New Scientist too long, but I got the distinct and discomforting impression that I was looking, not at some dreamy visual evocation of a musical mood, but at the the responses of single-celled life to desperate changes in their tiny environment. As for the music – which was, after all, the main draw for this evening – it is fair to say that Scelsi’s Uaxuctum would not be everyone’s cup of tea. For a quick steer, recall the waily bits from 2001: A Space Odyssey. That music was by the Hungarian composer György Ligeti, who was born about two decades after Scelsi, and was — both musically and personally — a lot less weird. Scelsi was a Parisian dandy who spent years in a mental institution playing one piano note again and again and Uaxuctum, composed in 1966, was such an incomprehensibly weird and difficult proposition, it didn’t get any performance at all for 21 years, and no UK performance at all before this one. 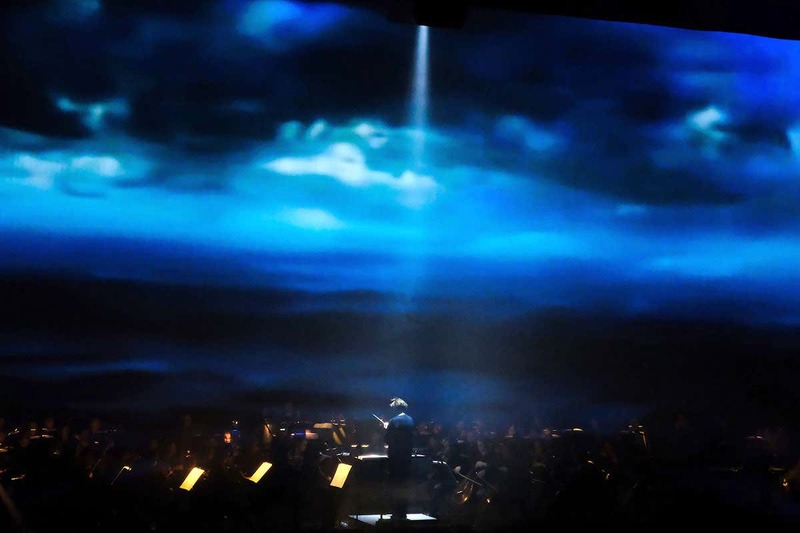 John Luther Adams’s Become Ocean (2013) is an easier (and more often performed) composition – The New Yorkermusic critic Alex Ross called it “the loveliest apocalypse in musical history”. This evening its welling sonorities brought hearts into mouths: rarely has mounting anxiety come wrapped in so beautiful a package. So I hope it takes nothing away from the LCO’s brave and accomplished playing to say that the visual component was the evening’s greatest triumph. The dream of “colour music” has ended in bathos and silliness for so many brilliant and ambitious musicians. Now, with the judicious application of some basic neural networking, we may at last be on the brink of fusing tone and colour into an art that’s genuinely new, and undeniably beautiful. This year, stalked by insomnia, I have been going to bed with Melvyn Bragg. More precisely, I have been putting myself to sleep with podcasts of Bragg’s BBC Radio 4 programme In Our Time, the best cultural contexter money can’t buy. On its website there are quizzes to check how much you remember, though I rarely score more than 4 out of 12. Podcasts, the St John’s College reading list, Wagner’s Ring cycle: I’ve been pouring culture down my throat the way the Danaids filled their bath, and to about the same effect. According to Greek legend, 49 of King Danaus’s 50 daughters were mariticidal, and condemned to fill a leaky bath in hell, and their lot is an apt metaphor for the human condition. However much we fill our lives, our lives still dribble away. We experience, we learn – but we also forget. Finally, we die. No wonder death is terrifying. It’s not just me that will perish on my deathbed. With me, a whole world will gutter out. One day in October, circumstances conspired to bring me a little comfort. The Wellcome Trust invited me along to a rehearsal of Singing with Friends, a community choir for families living with dementia, led by the Wigmore Hall in partnership with Westminster Arts. Wellcome’s interdisciplinary research group Created Out of Mind are trying to understand (and, where possible, quantify) the therapeutic properties of the arts in dementia care and the care of older people generally. Paul Camic, a psychologist at Canterbury Christ Church University, Kent, UK, was there to talk me through the research. Musically inclined readers may already be familiar with the idea that we recall best and most reliably the music we first heard between the ages of 15 and 21. This choir’s weekly rehearsals (four-part harmonies from a standing start, public performances announced, and a great deal of mutual mickey-taking) reveal something that for my money is much more exciting. Apparently, musically inclined people are more than capable of continuing their musical education, and achieving command of new material, in even quite advanced stages of dementia. Is there a general truth to be drawn here? That same morning saw me visiting Skarstedt Gallery in central London, and an exhibition of late canvases by Willem de Kooning. The American abstract-expressionist’s celebrated and long career ended in an Alzheimer’s diagnosis, and wags in search of a cheap laugh have long suggested that his last, ever-more minimal canvases reflected his mental deterioration. Face to face with this work, however, it’s clear that de Kooning was developing and exploiting new vocabularies of form, depth and colour right up to his retirement at the age of 86. Such stories take nothing away from the misery of dementia. I recall vividly, at the Wigmore Hall, the wife of a former jazz musician explaining how her husband, after hours of skilful extemporising around a new theme, would fail to remember how or where to go to the toilet. Then again, she also told me that attending Singing with Friends was like “coming out”; that for her husband and for the choir as a whole, excellence was still achievable; and that its attainment was all too rarely recognised by a squeamish wider world. Which is why I’m here typing that most unfashionable thing: a story with a moral. The bath is leaking. But then, the bath was always leaking. Deal with it. Keep going with the buckets. “Pour, pour, against the draining of the bath,” as Dylan Thomas didn’t say.